Valerian Root comes from the plant Valeriana officinalis, which is native to Europe. 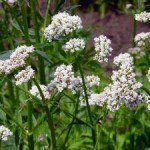 Valerian Root has also been called Garden Valerian, Indian Valerian, Pacific Valerian, Mexican Valerian, and Garden Heliotrope (Sloan-Kettering). Research suggests Valerian Root increases Gamma Aminobutyric Acid (GABA), synthesis in the Brain. GABA is an Inhibitory Neurotransmitter which is responsible for regulating the activity of our nervous system. As a result, it has applications in individuals with difficult sleeping. Valerian Root is available as an extract, tincture, capsule, tablet, or tea (UMMC). Research has shown Valerian Root helps individuals go to sleep, and even improves the quality of sleep. It is due to its ability to increase GABA synthesis in the brain, and decrease the activity of our nervous system. In a study conducted, individuals with Insomnia who received multiple doses of Valerian Extract went to sleep quicker when compared with participants who received a placebo. Also, Valerian Treatment resulted in individuals experiencing more REM sleep throughout the night, indicating improved sleep quality (Donath, Quispe, Diefenbach, and et al 47-53). However, contradictory studies analyzing many Clinical Trials with Valerian have shown its efficacy as a sleep aid to be inconclusive (Stevinson, and Ernst 91-99). Valerian has produced side effects such as headache, uneasiness, heart disturbances, morning drowsiness and impaired alertness, and over extended periods; liver toxicity and withdrawal symptoms (Sloan-Kettering). Since Valerian impairs alertness, individuals using Valerian should not drive or operate heavy machinery. Valerian is contraindicated in individuals who are on liver metabolized medications, sedatives, or who are having surgery which requires anesthesia. Also, women who are pregnant are nursing are advised not use Valerian (UMMC). Donath, F, S Quispe, K Diefenbach, et al. “Critical evaluation of the effect of valerian extract on sleep structure and sleep quality..” Pharmacopsychiatry. 33.2 (2000): 47-53. Web. 5 Jul. 2012. Ehrlich, Steven, NMD. “Valerian.” University of Maryland Medical Center. N.p., 4 May 2011. Web. 5 Jul 2012. Stevinson, C, and E Ernst. “Valerian for insomnia: a systematic review of randomized clinical trials..” Sleep Medicine. 1.2 (2000): 91-99. Web. 5 Jul. 2012. “Valerian.” Memorial Sloan-Kettering Cancer Center. N.p., 16 Jun 2011. Web. 5 Jul 2012.